The main east-west passenger line through metropolitan Tōkyō is a four-track line consisting of local and rapid (express) double-track lines. 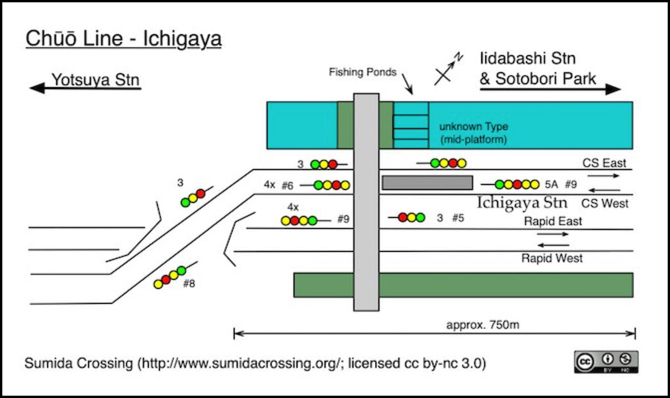 East of the Sumida river it consists of the Sōbu Main Line (総武本線, Sōbu-honsen) (local) and the Sōbu Rapid Line (rapid) (総武快速線, Sōbu-kaisoku-sen). West of Ochanomizu station, the line consists of the Chūō-Sōbu Line (中央・総武緩行線, Chūō-Sōbu-kankō-sen, lit. 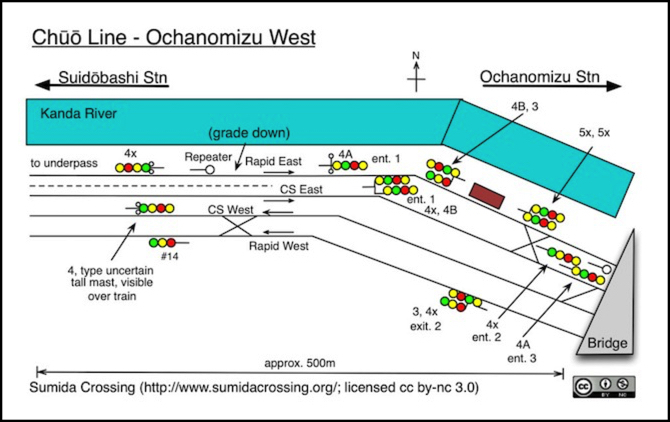 the Chūō-Sōbu slow line) (local) and the Chūō Main Line (中央本線, Chūō-honsen) (rapid). Between Ochanomizu, where the Chūō Main Line turns south to Tōkyō station and Kinshichō Station just east of the Sumida river, where the Sōbu Rapid Line goes underground and turns south to Tōkyō station there is only the single double-track Chūō-Sōbu Line, which runs through three intermediate stations, including Akihabara. Chūō, by the way, means “central” in Japanese, and may refer to the “special ward” (essentially a city in its own right) located around Tōkyō station and to its immediate east and south. However, the rail line’s name more likely refers to the entire line, of which the metropolitan portion is only a small part. The Chūō line actually extends 369 km (229 miles) to Nagoya, about two-thirds of the way to Osaka in western Japan. This line runs through the middle of the country, away from either coast, and hence is “central” in that regard. 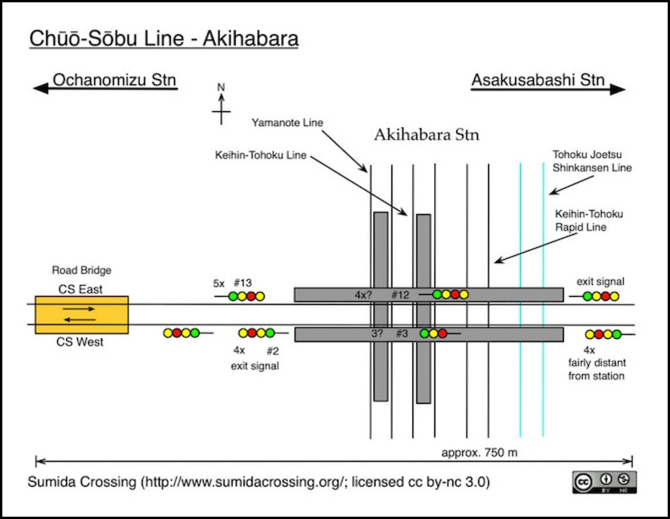 The Sōbu Line is not short either, extending 120 km (75 miles) from Tōkyō Station to Chōshi station on the coast north-east of Tōkyō in Chiba prefecture. Between them the lines bring hundreds of thousands of commuters into the city every day, on trains up to fifteen cars in length running on headways as short as a few minutes at peak times. Other railway lines access the city via these tracks as well, with run-through trains. Among these are the Narita Express trains; Narita airport is located in Chiba prefecture, on a branch known as the Narita line. Other run-through services include the Bōsō View Express (255 Series cars) from the Sotobō and Uchibō Lines to the east, and the E217 series cars of the Yokosuka Line (south of Tōkyō), some of which run as far as Narita. Finally, the colorful E257 trains from the east which run as far as Shinjuku on the west side of Tōkyō. Freight traffic east of Tōkyō appears to be entirely gone from the line now. To the west some freight remains on the Chūō Main Line outside of the metropolitan area. 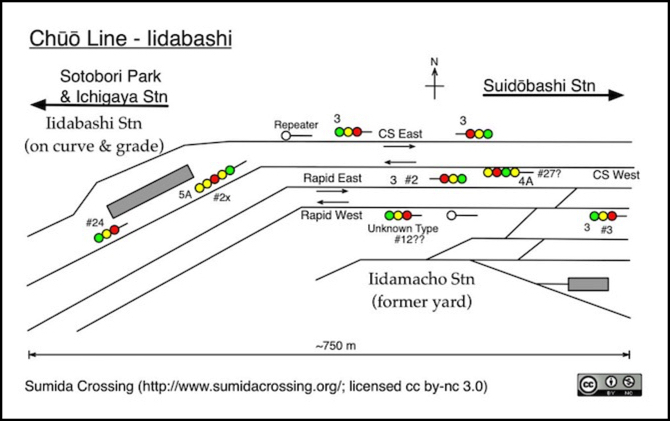 Formerly there were a couple of classification yards off the line, one to the east on the Etchūjima Cargo Line and one just west of Suidōbashi Station, and the Sōbu Freight Branch (also known as the “Shinkin Freight Line”), which runs north to near Kanamachi Station on the Jōban line. Those two lines appear to remain in use for JR East welded rail trains and nothing else. The urban portion from Ochanomizu west to Yotsuya, on the way to Shinjuku, is particularly interesting. Not only is it extremely busy, but it runs along portions of the former outer moat of the historic Edo castle complex, now mostly urbanized, except for the central portion that contains the Tōkyō Imperial Palace, home of the Emperor. The old moat is now used for recreational and drainage purposes, This is a particularly scenic line for an urban area, and a portion is backed by the linear Sotobori park, a long stretch of Japanese cherry trees (Sakura), which draw large crowds during the spring blossom-viewing season. I’ve mapped out the tracks and signals along this portion in detail, as I plan to model it, or at least a portion of it, eventually. The following diagrams show these details, moving west. Signals along this line are an interesting mix of three, four and five-lamp signal heads. Akihabara station (below) is just east of Ochanomizu station, and a couple of stations west of the Sumida River. The Chūō-Sōbu Line runs on a high viaduct here, before crossing the Kanda river and entering Ochanomizu station. 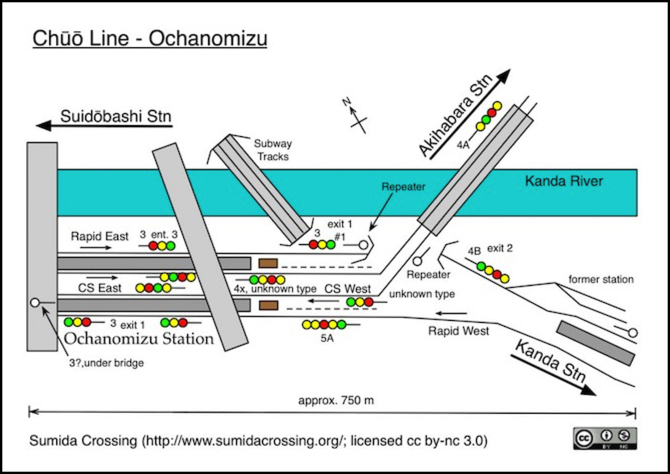 Ochanomizu station is set on the bank of the Kanda, slightly below street level at the west end, and slightly above street level at the east, as the land drops from a hilltop down towards the lowlands bordering the Sumida river to the east. West of Ochanomizu station the tracks run along an embankment above the river, still below street level behind a row of buildings facing a street to the south, out of sight except from the far side of the small Kanda River. 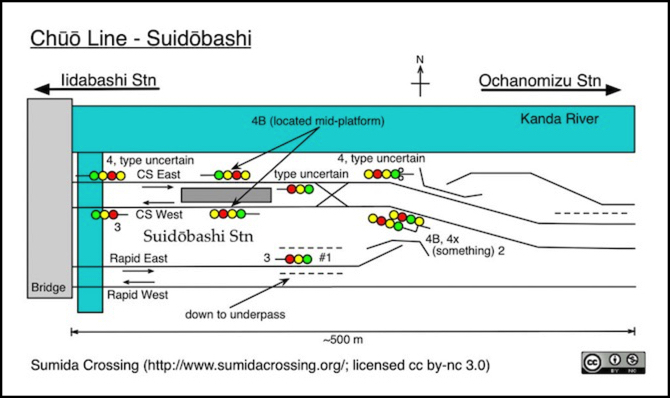 A complex set of interlockings here allows trains to cross between the express and local lines to the west and the Chūō-Sōbu and Chūō Main Line (to Tōkyō) to the east. Signals here have three to five heads, and some masts have two sets of parallel heads to control passage onto diverging tracks. At Suidōbashi Station the land drops down past the tracks, which run on an elevated fill west of here, at least for a ways. This is also where the eastbound line of the Chūō Rapid line crosses under the Chūō-Sōbu line to join its westbound track on the south side of the alignment. Just west of the station the tracks cross over a small canal, which connects the Kanda River to the moat surrounding the Imperial Palace and adjacent government lands. The canal is almost entirely hidden from view from above by a highway, but this is elevated relative to the adjacent land. West of Suidōbashi the tracks run past the former freight yard at Iidamacho Station (not a passenger station, but some kind of maintenance vehicle facility), and then curve to the southwest and descend below street level as they pass through Iidabashi station (which is both on a curve and a steep grade; potentially an interesting model). West of Iidabashi Station the tracks run alongside Sotobori park for about a kilometer. 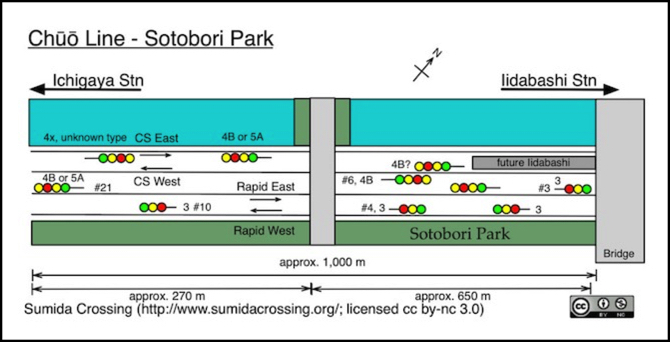 The park itself is a narrow strip of grass and Sakura trees, and a few shrubs, with a pedestrian trail through it, sandwiched between the tracks (which are below the park) and the adjacent street. The water here is no longer the Kanda River, but a relatively stagnant portion of the old Imperial moat, which is fed from the Kanda (at a higher elevation) and apparently drains to the south-west (the Kanda itself drains to the east into the Sumida River). Pas the park lies Ichigaya station, and then the Chūō-Sōbu tracks climb and cross over the Chūō Main Line tracks. 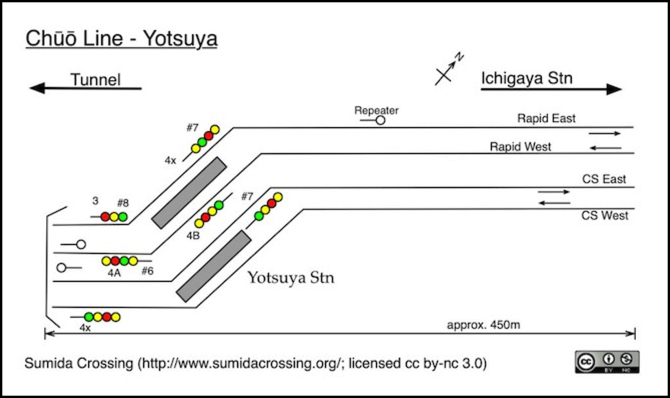 Finally, all four tracks pass through Yotsuya station, the only stop on the Chūō Main Line between Ochanomizu and Shinjuku station. Just west of Yotsuya the tracks enter four separate tunnels, and curve to run west to Shinjuku a couple of kilometers away.